6 What changed in the past 2 months? 7 Well, let’s check it out – best AeroBed out there or a bust? It’s time for the review UPDATE of a very frequent visitor to our top 3 guides – the Aerobed Classic low rise. We’ve already been over the company’s history so many times before in other texts and reviews, but we’ll always have to stress the innovative spirit behind AeroBed. They brought something new to the table the moment they hit the stage. Their revolutionary inflating/deflating system did everything so much faster than before. They’ve continued this trend to this day, and they exist for 24 years now. It’s not an easy pace to keep. It’s not as stylish as some of it’s Aerobed “cousins” (like the Aerobed King Double High for example), but the value for money is where it shines. 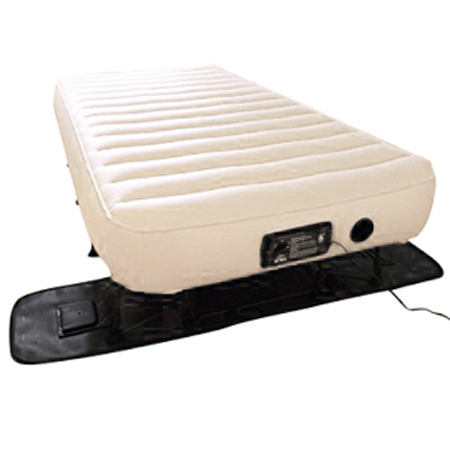 Bottom line – this air mattress is currently placed 3rd in the guide containing reviews and ratings of currently best Aerobeds. What changed in the past 2 months? As far as our overall rating goes, nothing much. It’s still at a solid 79. This basically means it won’t be winning any “Best…” anytime soon, but it’s a solid mattress that obviously performs well and doesn’t nuke your budget when you get it. We’ve got a ton of new user REVIEWS for you, most of them coming from our personal E-mail correspondence with buyers all around the globe. We’ve gathered their experiences (god and bad), specifically for this update in order to give you a fresh look at this model. We’ve done some additional TESTS this time around, so we’ll soon have a detailed performance report. We hate doing an update without even a single new test since we know how much you love it. Last time, we experienced technical difficulties so the testing stage couldn’t be completed in time for the scheduled update. Everything went smoothly this time around, so we’ve got some interesting data to share with you in the follow-up article. So, there’s plenty of useful GOODIES to go around. We hope they’ll help you make a completely informed decision if you’re thinking about buying AeroBed Classic blow-up mattress. Those would be the ABCs of our air mattress reviewing method. Well, more of writing the articles if we’re honest. The science, testing processes, endless correspondence and mailing products back and forth are just an inkling of what you DON’T get to see in that final number we call 3B rating. We never fail to mention AeroBed is not big on words. It doesn’t really matter, after all, if the mattress is good. Well, let’s check it out – best AeroBed out there or a bust? I was wondering about space I’ll need to store this air mattress when I’m not using it. It’s my first inflatable bed, so I didn’t really know what to expect. I bought 2, eventually, and I can fit them both into one carry bag (the one that comes with the mattress). It’s perfect! It appears really well-made. The vinyl is thick, and the inside isn’t just one big chamber but a lot of them, and they support me like no air mattress before. Top-quality at a top budget-friendly price! There is no built-in pump! Like all AeroBeds, the Classic takes great pride in being among the fastest “inflaters” out there. Deflation is even faster and easier. Having said that, I’ll just put this out there. This is one good air mattress. Not amazing, not the best AeroBed, just very good for the price. It doesn’t really come close to the quality of the best Aerobed out there – the Premier, but it does just what it’s supposed to – offers value for money and a solution if packing size and space are an issue. It also offers good comfort and durability, mixed with a sturdy build and overall user-friendliness. As you see, it’s all good. Nothing is exceptional about this inflatable bed, but it’ll all do the job when push comes to shove. On the other hand, some of the major CONs are the plastic smell, cold feel in low temperatures and a somewhat annoying external pump. So, we want to tell you exactly what you’ll be dealing with if you decide to buy this air mattress. You’ll be getting a product that’s well-worth the money you paid for it. That’s the bottom line. We know this might sound like a roast paired with AeroBed bashing, but we said it, and we mean it. This is one GOOD air mattress. See you in the next update with a ton of new INFO and one “out-of-the-box” mechanical TEST.